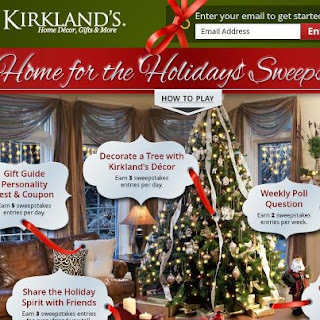 Beautiful Incentives: Kirklands Home Decor Holiday Sweepstakes! Win 10k, take fun quizzes, get coupons and free stuff! Kirklands Home Decor Holiday Sweepstakes! Win 10k, take fun quizzes, get coupons and free stuff! Kirkland's Home Decor, Gifts and More! A virtual Christmas wonderland to play in! It's FUN-dimental! Take quizzes about yourself and earn coupons and free things! If you're a sweepstakes winner, you'll receive an email on or around December 27 letting you know the good news. Share the Holiday Spirit with Friends! Do you love the holidays for an excuse to decorate your home or maybe you just like to add a little something here or there to give your place of relaxation and yourself a lift. 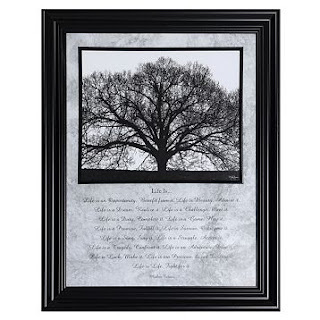 Kirklands offers gorgeous pieces at incredibly competitive prices. See how their decor can change your living space and participate in the sweepstakes for a chance to win today! 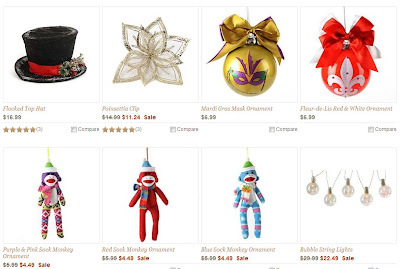 So CHEAP and how cute are those sock monkies? Look at this beautiful framed pic. Items going fast! Have fun!